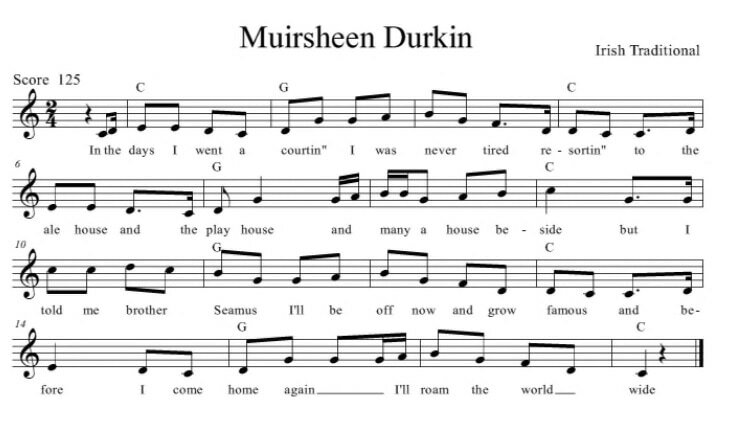 This song is recorded by The Irish Rovers and by The Wolfe Tones as ''Goodbye Mrs. Durkin''. It was a big hit for Johnny McEvoy, also recorded by The Dubliners with Luke Kelly singing. A traditional song from the 1850's The video is of The Dubliners preforming Mursheen Durkin on the Ed Sullivan show, they were supposed to sing Seven Drunken Nights but Ed Sullivan said it was not fit for his show. The last verse was sent to me by Garrett Taylor. The sheet music is included. And before l'd[G] return again l'd roam the world[C] wide. And when I come back again I never more will stray. When i landed in America i met a man named Burke. he told me if i wait awhile he'd surely find me work. but work he did not find me so there's nothing here to bind me. and i'm off to seek my fortune in californ-i-a.